Here is Haley's e-mail, and her bedroom as it looks now. 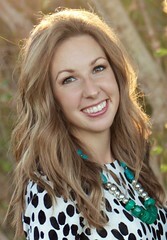 LOVE your blog, style, and your house is lovely! I'm writing because I need your advice on what to hang above our bed (and our DIY headboard - tutorial courtesy of Young House Love!) - I'm torn on whether this should be one big frame, three small ones, a cool mirror, or any other option? I also want to give more texture to the room b/c I feel it is a little too "matchy-matchy" right now. I'm thinking of spray painting my lamp bases in a different color (any suggestions on color?). I also would like to keep the art on the cheap if possible. Would love to hear any guidance you could give me! Here are my suggestions for Haley. 1 / 2 - First, I think the room could use some new throw pillows to punch up the color a bit. Pillow 1 is from Pier 1 and Pillow 2 is from Crate and Barrel. 3 - A cute and shiny retro alarm clock to add a little bling. 4 - This lamp is a rendering of my suggestion to makeover Haley's current lamps. I think new white shades like this one would update the lamps a little, the current shades blend in with the wall too much. Gluing some red ribbon along the trim of the shade would give the lamps even more style. Finally, I couple of coats of silver spray paint on the lamp bases would finish off the look. 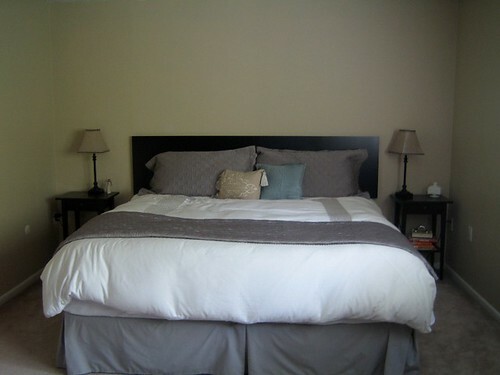 5 - I like a simple mirror hung above a bed, this one from Target is chic and affordable. 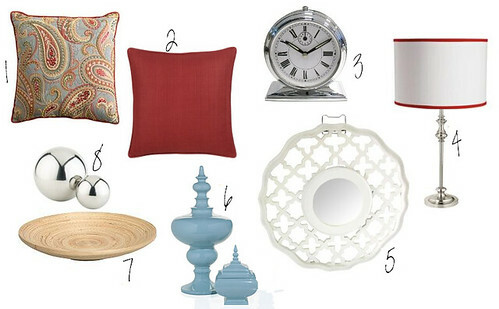 6 - Blue canisters to add even more color, and tie in with the paisley pillow. 7 / 8 - Some simple stainless steel balls set in a wooden dish adds texture and shine. Thanks for your suggestions - they are great and will definitely make the room a lot more interesting! I'll keep you posted with the final product. Thanks again, Erica!